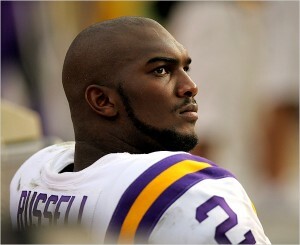 Has anyone else seen ESPN’s latest interview with JaMarcus Russell? Well, I have. Immediately after struggling through my favorite network’s feeble attempt to resurrect a sports figure who clearly isn’t worth the attention, I was struck by ten questions. 1 – With the millions JaMarcus stole, er…. earned from the Oakland Raiders, is that Cubic Zirconia on his ears or are those actual diamonds? Those things are HUGE! He might have more karats per ear than career touchdowns. 2 – After “allegedly” attending classes at LSU for three years, why can Russell still not speak in complete sentences? 3 – Is another NFL team actually willing to take a chance on this guy? 4 – What was the need to even conduct this interview? Is ESPN really THAT out of news stories? Can’t they just talk about Brett Favre some more? 5 – What is going on with Colleen Dominguez’s eyelashes? Did she just come back from a night out of clubbing? 6 – What is purple drank anyway and does it taste anything like Kool-aid? 7 – Does anyone actually have the Raiders winning more than six games this year? 8 – Did LeBron’s “Decision” subsidize this interview? 9 – Does anyone else think Tim Tebow WON’T have a better career than this guy? 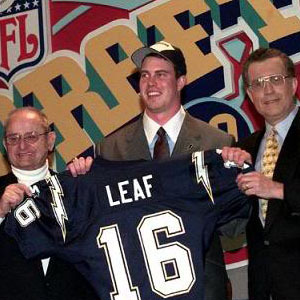 10 – Does Ryan Leaf sleep any easier at night knowing he is no longer considered the biggest NFL draft bust of all time? This entry was posted in Pigskin, Screen and tagged Brett Favre, Colleen Dominguez, ESPN, JaMarcus Russell, Kool-Aid, LeBron James, NFL, Oakland Raiders, Ryan Leaf, Tim Tebow by Chris Humpherys. Bookmark the permalink. I’d have explained myself, but that’d make it look like I know more than I should, haha. Leaf doesn’t he now sleep with one eye open his cell because of his cellmate Bubba ? Oh to be someone’s prison bi_ch ! LOL,LOL, !! JaMarcus is able to enunciate ? Colleen Dominguez is way smarter than Jim Gray then ! Tebow obviously forgot that the pic of his dome looking like that won’t get him an endorsement from Supercuts that’s for sure . If you’re Joe Torre and Dodgers how the hell can live with yourself after last night’s meltdown against the Phillies ? Truth , Fact or Fiction …… ? EG actually wrote that Purple Drank wikipedia page. Is Leaf still in the slam, Al? Do you think he’s even the starting QB for his prison team? And what the hell is up with Jim Gray these days? Just when you thought that guy couldn’t get any more annoying. Tebow Monk? Are you sure about that, Al? He’s already the highest-selling jersey in he league. Kid’s image could probably sell ice to an eskimo. And I like how the Dodgers are blaming this entire season on the McCourts. Now that would be a reality tv show I might watch. Well, I am from smack dab in the middle of the dirty South, after all! Haven’t seen Jamarcus hanging around the pharmacy at any of the nearby CVS or Riteaid stores yet though. Now, I need to go finish getting my drank on, so I’m out! Wherever your travels take you, my friend, you will always be the Oz behind the Wizard. Like I’ve said before, a match made in heaven, so don’t go deserting the Chump now. We should have earned enough by now for you to restore that laptop. 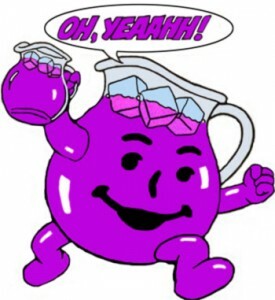 And if you end up in Seattle, be sure to tell Starbucks about that Purple Drank. You just might be on to something. I did happen to hear that interview. It’s really difficult for me to believe Al Davis drafted this guy in the first place… Did he take a dare or something? Based on the Raiders most recent draft I have to believe Al’s finally out of the draft day decision mix (Do they keep him medicated now? Straight Jacket?). I hear some people saying they’re actually sorry for Russell. Hell, he’s got how much money for doing next to nothing? I don’t feel sorry for him, but watch, he’s gonna blow all that money and in a couple of years he’ll be leading the charge for some of that Obama money! Al Davis is the one that screwed up. You really think Russell is a bigger draft bust than Leaf? Maybe you’re right, but Leaf will always be #1 in the hearts of all SD Chargers fans. Forever…and ever. p.s. I’ll take anything and anybody over more Brett Favre talk. Russell, Leaf, Andrew Ware, Akili Smith…anybody. Yeah, Dwin, I don’t feel one bit sorry for the guy. He came out with a lot of potential and it seems like he didn’t even try to make the most of it. So for that reason, and his paycheck, I can’t bring myself to feel sorry for the guy. Don’t quote me on this but I think this pick was up to Lane Kiffin which is what caused such a huge riff between he and Davis. Putting aside your SD allegiance for a while, think about it. Yes, teams were allegedly deciding between Leaf and Manning, which looks ridiculous now (Bowie-Jordan) but think about what Russell did to that Oakland franchise. He took them for a LOT of money. Actually, looking at their numbers, Drew, Leaf’s were considerably worse for their time in the league. Okay, how bout this? They both really sucked. I can’t say enough bad about JAmarcus. I hope someone gives him a chance so his last snaps aren’t in a Raiders jersey. Then I can laugh at another team that took a chance on him! We can agree on that, Chris. Both Leaf and JaDreadful really sucked. It wouldn’t surprise me if another team did actually. At least they wouldn’t have to take on a huge A-Rod-like contract in doing so. That’s exactly why I have to give Russell the nod over Leaf. Besides, the Colts did the right thing in selecting Manning. Had Leaf been selected over Manning, then it’d be a whole different ballgame. Can we get an over/under on how long it will take Russell to end up in the joint? Either that or to be revived and start talking to America’s youth about the dangers of taking codeine. Maybe the Bucs should pick up JaMarcus, after all their defense made him look good a couple of years ago. Imagine what working against their second team defense could do for his confidence. As a Bucs fan, I’m torn, Aer. For the league min, maybe. The local papers were raving about Freeman’s performance against the Fish the other night. I couldn’t watch every play as I was working but that one pick he had was horrendous. He needs to correct those things… STAT! He’s got to do some time as he’d violated part of his probation arising from another incident. Jim Gray is like a dose of gonorrhea that’s an STD that no would want to have around. But somehow ESPN sees him as a legitimate sports reporter . Isn’ty that like asking Jayson Blair to give you coverage of the wars in Afghanistan and Iraq combined ? Somewhere along the way you know the stories will be filled truths and half truths. In the case of Gray what you see is what you get and that’s a pompous overbearing as_hole who thinks that he’s more important than he really is ! Tim Tebow will one day be viewed as the second coming of Christ . Love the hair do . If the Bucks sign him, you will regret it!!! I didn’t mean to submit that yet. I was going to say he breeds laziness, and you don’t want his laziness rubbing off on others, and that’s what he did in Oakland for three years. He made other guys not care. He was the best anti-leader I’ve ever seen! We aims to please here at the Chump. I’m perfectly okay with seeing Gray only once every six months for a special sporting occasion. It gives us something to talk about. And what do you mean ONE DAY Tebow will be considered the second coming? Maybe the Milwaukee Bucks should sign him. Have you seen the size of that guy? He was clearly the biggest guy in that courtroom video and could play alongside Bogut clearing up space in the Milwaukee paint. You didn’t read what I tweeted last week? I said the MRI on Albert Haynesworth’s knee showed traces of laziness. Perhaps he and Russell go to the same doctor. That wasn’t Freeman’s pic (he was 4 for 4) it was the other Josh, Johnson. We might be in bigger trouble if Freeman gets hurt. Ah, ok then Aer. Like I said, I was looking up at the TV whenever I could and so I thought Freeman was still in the game at that point. Glad to hear that wasn’t him. That one pick was horrible. The Bucs have made it clear. Freeman is their guy so there would really be no reason to sign anyone other than a backup and they’re a dime a dozen these days. I did see two of Freeman’s completions, the one along the right sidelines and then the touchdown pass to Stroughter. Needless to say, I’m hoping this is the guy to lead our team to victory for a long time to come. This is an excellent blog here! I just added it to my favorites.